Patty Hou (侯佩岑) and Michelle Yeoh (杨紫琼) attended Shiatzy Chen Spring/Summer 2013 fashion show held during Paris Fashion Week at Grand Hotel Intercontinental in Paris, France on October 2, 2012. While Patty Hou (侯佩岑) seemed to be overdressed in the red embellished gown from Fall/Winter 2012, you can't deny that she looks incredible. Would have love to see the dress on the red carpet instead. 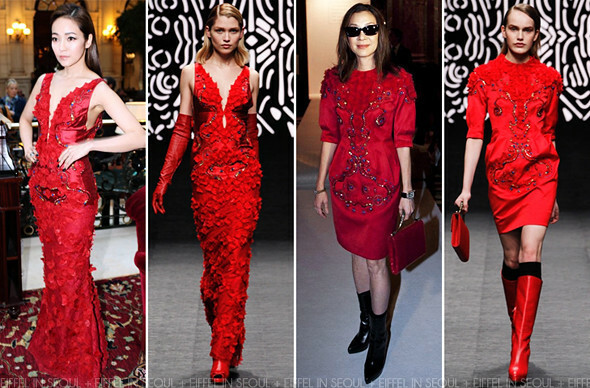 Michelle Yeoh (杨紫琼) opted for a red embellished dress from the same collection. Black leather boots and a red purse from the collection to complete her look. Her look was destroyed by those ugly boots. A pair of simple pumps would have done the job.